Being an advisor on LiveAdvice means earning money for your knowledge, wherever and whenever you can assist your customers. But you won't always be able to be available to customers, and you don't want to miss any opportunities, either. That's why Office Hours and our robust availability and communication management tools are so valuable; managing your availability makes sure customers can reach you only when you want them too � and when you're busy or unavailable, customers can arrange to talk to you at a later time. How do I manage my availability and communications settings? Enables a customer to request an appointment only within the Advisor's defined Office Hours. Enabled: an Appointment button always displays on Advisor Listing Details page. Disabled: No button is shown and customers can't request an appointment. 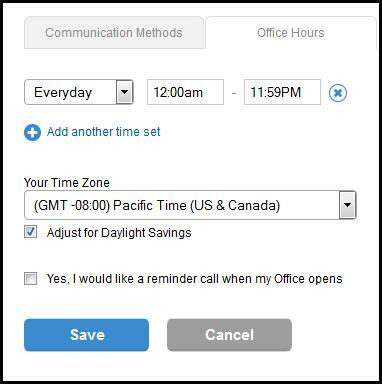 Enables the Call Now button to automatically display corresponding to Office Hours without a scheduled appointment. During Office Hours, customers can call immediately without needing an appointment. Outside of Office Hours, no call button is displayed. You can always override regular Office Hours to display Call Now via the Advisor Dashboard (aka My Account). Enabling this status allows customers to be called back if you are busy assisting other customers. Allows customers to request a Call Back when you are busy. A Call Back button replaces Call Now button if you're busy. You can also choose to be notified via email when a new Call Back request is received. Send Mail button will appear. To launch Chat, you use the toggle control via the Advisor Dashboard. If you have Chat enabled on at least one of your listings, the chat toggle control will display on the Advisor Dashboard. To launch Chat, click the toggle to on (the "off" button will disappear; details to turn chat off below). When turned on, the Chat Now button will display in various places on LiveAdvice. To log out of chat or turn off, you must close the Chat Monitor window. When doing so, a Chat Later button will display on your listing. The chat toggle control will not display on the Advisor Dashboard. Unlike other buttons, the Mail button is always enabled so that clients can reach you. You can enable the Auto-Reply feature to send an auto-response to incoming Mails. When do the various communication buttons appear on my listing? Call Now has been enabled from Advisor Dashboard. Call Now has been enabled from Communication Methods to automatically display during Office Hours. Call Now has not been enabled from Advisor Dashboard. Call Now has not been enabled from Communication Methods to automatically display during Office Hours. Call Back button appears when it has been enabled from Communication Methods to automatically display when you are busy assisting other customers. Call Back button will not appear if you have not enabled the feature. A Send Mail button will display instead. Chat buttons will only appear if you have enabled Chat on your listing. Chat buttons will not appear if you have not enabled Chat. Request Appt. will only appear if you've enabled this feature from Communication Methods. If you have not enabled appointments, the button will not appear. This button always appears for every listing. This cannot be disabled, but you can create a custom auto-reply message for incoming mails. How does the Office Hours module which displays on my listing function? This module displays the hours you're generally open for business and will appear below your communication buttons on the right side of the page. 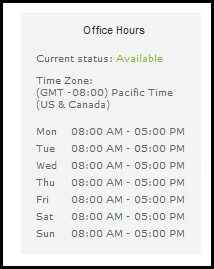 If a customer is logged in, your hours will display in their time zone. If a customer is not logged in, the time zone will display as Pacific Time (system default). Because "Call Now" functionality can work independently of Office Hours, availability state is also displayed in the Office Hours module. This eliminates doubt or confusion for customers if they want to converse with you when you are accepting calls outside of Office Hours. What are the default settings for Office Hours? Time Zone: We use your current settings. You can manage from your Personal Info page. I'd rather manage my availability without using a set schedule of Office Hours. Can I do that? Set your Office Hours to be open 24 hours (12:00AM to 11:59PM), 7 days a week by going to "Settings > Office Hours." Uncheck the "Call Now" box on "Settings > Communication Methods." Use the "Call Now" status toggle located on the Advisor Dashboard (aka My Account) to manually make yourself available as well as to turn off your availability.